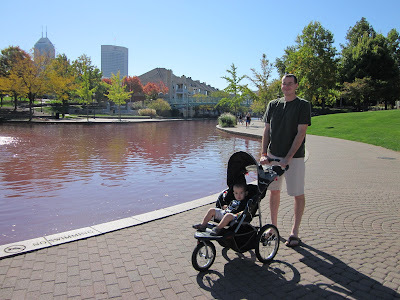 One of my favorite spots in downtown Indianapolis (we used to live there and we visit frequently) is the Canal Walk. This is a man-made creation (a failed attempt many years ago to make the city a port). It meanders through the west end of downtown, slightly below street level (much like the River Walk in San Antonio). As the name suggests, the Canal is a great spot to take a walk. While the south end of the canal has tons of attractions, like the Indiana State Museum, the NCAA Hall of Champions, and White River State Park, the north end has lots of open spaces, fountains, views of the skyline, etc. Don't be disgusted by the water in this shot. It was dyed pink a few days earlier for Breast Cancer Awareness Month. When we lived in Indianapolis, I often took the arrow for a walk here. It was one of my favorite early outings with him--he was so tiny and snuggly then, and usually slept right through it. To really come full circle, when my water broke my OB encouraged me to go for a walk before coming to the hospital to try to spur contractions. We went to the canal because its only a few blocks from the hospital, naively thinking the arrow might pop out at any moment. (By the way, the walk didn't work... the arrow was born THREE days later. Oof.) Needless to say, its a special spot with lots of memories for our little family. 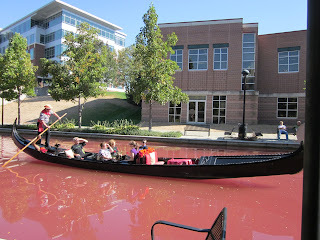 If you want to know more about our morning along the Canal, check out my post at the Indiana Insider. 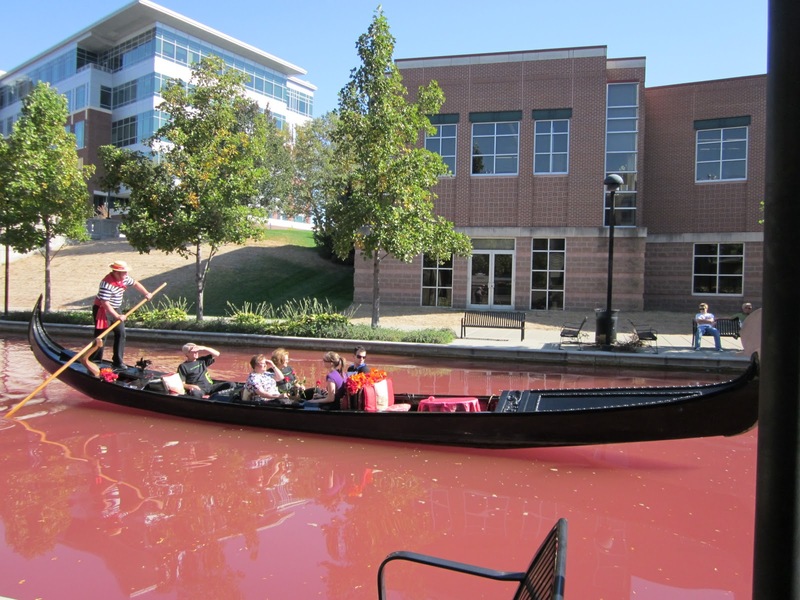 PS: If you've always dreamed of a gondola ride in Venice, Indy scored a few of those special boats and you can live out your dream in the Circle City. They'll even serenade you. Do they dye the water for causes often? Looks like a great place to wander! I totally know what you mean about special spots that are memorable for your family. When we lived in Dayton, there was a duck pond near our house that we used to visit almost every day. I was a little sad to say goodbye to it when we moved to Texas. This canal must hold a lot of sentimental value for you. Glad you pointed out why the water is pink! They do dye it often. Green for St. Patty's, bright blue for big Colts games, etc. I think this might have been the first time it was dyed pink. It looked like Kool Aid. :) Thanks for the nice comments, all! very cool - i had NO IDEA that this was in indy! my aunt lives there - we'll need to go visit! This does look like a great place for a walk.